I want a couple of each of the hats -- 'Obama' and 'Forward' -- but the site to make the purchase(s) only offers the one 'Obama' hat from what I am able to determine. I can't find a link to buy the 'Forward' hat too. Can I get some of each or is it just the 'Obama' hat only now? "Placards are made of plastic and fit into 1-inch button holes in the hat. Side placards attach to the ushanka ear flaps. The latest front placard (OBAMA/FORWARD), and all other available placards will be included in your order." 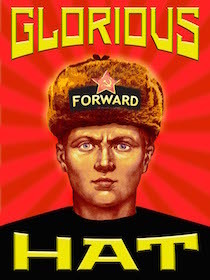 I intend to wear the hat while also carrying a bottle of Leninade -- label side 'Forward' -- when I vote. I wonder if the poll workers will even let me in the building much less wear it while I vote. Sorry for the confusion Comrade. Please send pictures of your voting experience!